Raqs Sharqi, is the phrase translated from Arabic, which literally means "Dance of the Orient". It is this that middle Eastern people use to name their dance form. The origins of the dance are uncertain but are known to be very ancient. It was not until during the 19th century when travelling artists and writers visited the Middle East that it was discovered. They became fascinated by the dancers ability to perform such unfamiliar movements of the pelvis and torso. Their interest was such that they regularly employed the dancers to entertain at parties and the dancer often became the focal point of many an artists impression, more fantasy than reality in most cases, the professional dancers at the time were classified as either Ghawezee or Awalim. The Ghawazee were gypsies and were frowned upon. They would often dance for the lower class audiences outside or in courtyards. The Awalim were the more respected and would perform in the courts for the rich and highly educated. 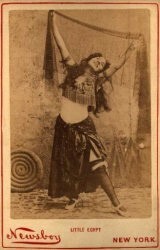 In the late 1800's the World Fair arrived in Chicago and with it "Little Egypt" a Middle Eastern dancer that caused a sensation. She shocked and delighted audiences and inspired a host of imitators. Her presence coinsided and greatly influenced the fashion of that time known as "Orientalism". During the early 20th century, nightclubs sprang up all over Cairo to entertain the western colonialists and tourists giving way to a more cabaret style of entertainment. Here some of the greats such as Tareheha Carioca, Naima Akef and Samia Gamal began their careers. This trend has continued through to the present day and many of today's "Stars" perform at 5 star hotels or at their own clubs. The influence of Hollywood in the 1930's really changed the look of the dance. the distinctive two piece costume was born. Encrusted with glitter, sequins and beads, the costume exposed the "belly" giving more of a sensual and alluring look. The dance was also westernized by using upper torso movement, serpentine arms, veils, dramatic poses and with the influence of ballet travelling and moving in space were often included as part of their routine. Samia Gamal even began to wear high heels. Raqs Sharqi is an art form enjoyed by both sexes and young and old alike. It is an integral part of the Middle Eastern culture. In Egypt, no marriage or celebration would be complete without a Raqs Sharqi performance. Almost all Egyptian women can dance, having learnt as children, not in dance classes but at home and at family gatherings. Few women, however dance for a living. As the reputation of a professional dancer is suspect in a traditional muslim society. From time to time the dance has almost been banned by muslim fundamentalists. Fortunately, now the dance lives on stronger than ever and is much appreciated throughout the world as a growing and ever changing art form.